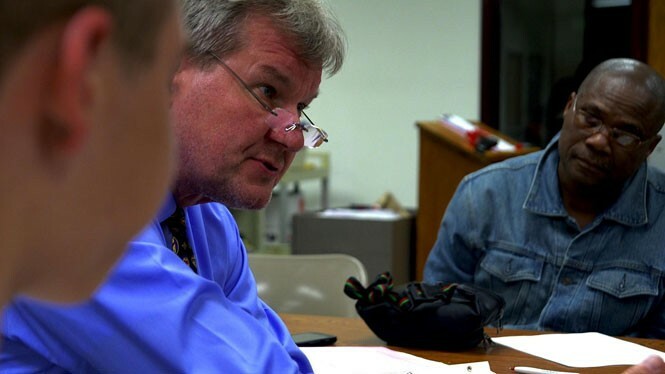 City Weekly critics discuss the provocative "documentary"
Director Jesse Moss' nonfiction film The Overnighters examines the controversy in the town of Williston, N.D., where Lutheran pastor Rev. Jay Reinke allowed his church building and its parking lot to serve as a de facto homeless shelter for men coming to town to find work in the booming nearby oil shale fields. Two critics decided to exchange thoughts on the movie. Scott Renshaw: I want to start with what might seem like a prosaic question, but: What is this movie about? Because it strikes me that it's not the simple "look how self-described Christians behave when faced with a real Christian act of charity" sting-piece the setup initially suggests. Danny Bowes: It's definitely not that simple. There are a few other things it touches on that could be whole movies of their own—family, the media, the failure of American capitalism to sustain the workers who keep it running—and things it ignores, like the environmental destruction fracking is causing in North Dakota and elsewhere. There's also another thing it could be about, but revealing it could be a spoiler. The film ultimately ends up being about Jay Reinke, which is fine, but ends up being kind of a Sundance version of a Lifetime movie about Jay Reinke, which is a little disappointing. SR: I'm actually not convinced it's primarily about Jay Reinke. The amount of time that's spent with some of the recent transplants suggests to me—and you kind of touched on this—that it's more generally about an idea of "The American Dream" to which we give lip service, but which is thwarted repeatedly by people's anxieties and economic realities. If this movie's knives are out for anyone, it's salt-of-the-earth heartland folk who think real America is pulling your shotgun (literal or metaphorical) on anyone who looks sideways at you. DB: The fact that we're not even in agreement about something as simple as what it's about is a sign that the whole enterprise lacks focus. Which is especially odd in a film where everything feels so staged. When you mentioned that you had one huge problem with it, that general overall feel was the first thing that I thought of. SR: I don't consider the fact that it may be "about" more than one thing inherently problematic; really interesting art can lead you down multiple paths. But you certainly raise the eternal question of how much of a "fly on the wall"-type documentary can be trusted to be authentic when the cameras are in everyone's face. And that "one huge problem" to which you refer ... well, it's hard to be specific, since it applies to that late perspective-shift, but it's one of the rare cases I can remember where I thought a documentary filmmaker's decision to include a specific moment was pretty much a moral failing. DB: Yeah, the scene in question made me say out loud (and pretty loud): "WHY ARE YOU FILMING THIS?" And, while certainly the most egregious example, it was definitely not the only thing in the movie that felt rehearsed, blocked, even scripted. There's certainly more than one way to make a nonfiction film—"documentary" seems like a bit of a stretch here, especially considering it wasn't the term the director used to refer to it—but if you're going to go to all that trouble to stage something, you might as well write a script and hire actors. Instead, scenes like the one we both hate feel like half-measures, impediments to the film's goals rather than necessary aspects of the process. SR: The shame of it is, I actually found it pretty powerful at capturing the cost of societal stigmatizing ... right up until That Scene. DB: The ultimate dilemma here, to me, is a filmmaker wanting to have the immediacy of cinema verité and the drama of more theatrical forms ... compromising in a way that makes it a poor example of both. The fact that there's A Big Third-Act Twist that isn't an organic part of the story's chronology is a symptom of the problem: It's a real thing that's true, but it's also something we—or I, anyway—guessed in the first 10 minutes, withheld until the end so it can be dramatic. It is possible to strike a balance between verité and theater, but The Overnighters doesn't quite find it.